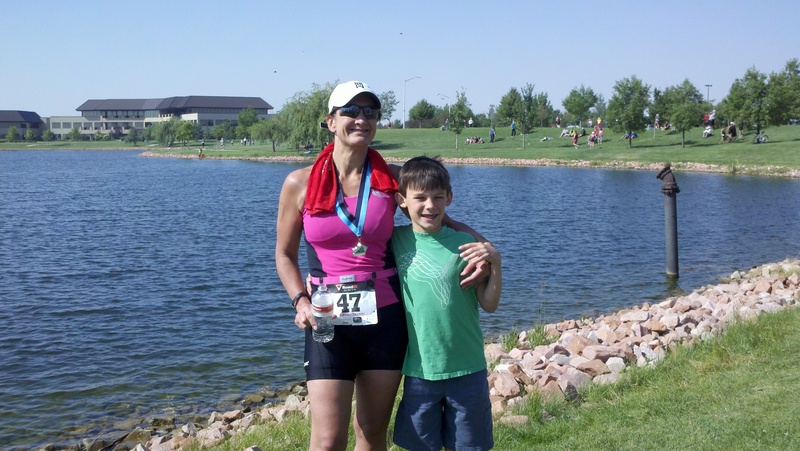 My 2012 triathlon season kicked-off on Sunday June 10th at the Greeley Sprint Triathlon (www.greeleytriathlon.com). This event has the reputation of being reasonable in size and well-organized. It absolutely lived up to those claims! I attended the pre-race meeting the afternoon before and felt ready to jump into my first TRI of the year. BUT, on the morning of the event a major forest fire on the outskirts of Ft Collins coupled with a weather front had created conditions that introduced the possibility of the event being cancelled due to poor air quality and bad weather. UGH! Yes, the air was a bit smoky and the weather blustery but the event was set up and the athletes, me included were ready to GO! After a brief delay, the decision was made…and it was a green light for the event to proceed. Now the adrenaline was really starting to flow. The swim for this event was a time trial start—I wasn’t familiar with the approach used which was oldest first and then each subsequent swimmer every 5 seconds. And so, the oldest male age grouper who I believe was 82 started the age-groupers in the event (oldest female was 73)…what’s scary is that I was the 47th swimmer in the water as oldness goes! EEEK! Which was reenforced by the prominently displayed large black # written in Sharpie on the back of my right calf…50! So when it was my turn, as the others before me, I launched off of a rubber mat into surprisingly clean, clear and temperate water. My new Sable swim goggles, immediately filled with water requiring adjusting but the 500 meter swim was quickly done. Approaching T1, I thought how cool it was that they, had wetsuit “strippers”. No! not the kind of strippers that wear minimal or no clothing, but folks that forcibly pull your wetsuit quickly off your body. Given that I had @CoachCary’s Helix wetsuit on loan I didn’t want to risk damaging it…so, I proceeded with my typical T1 routine. This time it seemed like I took forever to get that wetsuit off and after the race Guy #2 (son) said “Mom, you looked just AWFUL when you got done with the swim…like you’d run a marathon or something”. Guy #1 (husband) elaborated “you were fine and didn’t look any worse than about half of the other swimmers getting out of the water”. So glad to hear how awesome I looked…Humph! True, I did feel a little off kilter and wobbly…who knows why!? Anyway, my T1 time ended up being respectable at a 1:52. Hopping onto “Zen Boy” my Giant bike, I could feel some difficulty in my breathing, which I think (duh) was due to air conditions. The Bike portion of the race was uneventful (always thankful for that). T2 proceeded quickly and I was out onto the run. Now, I had debated about wearing my Garmin to track my run pace. See…I have this issue were I cannot tell the difference between running a 7:30 vs. 9:30 mile pace…other than when I become exhausted since I cannot sustain a 7:30 pace and then have to either walk or jog at a snail’s pace. Garmin was not worn…decided to just go for it. Well…too quick of a run pace combined with less than crystal clean air resulted in my having to WALK for a brief time; on not one, or two but three occasions during this 5K. WHAT?! After all my training and focus on running! 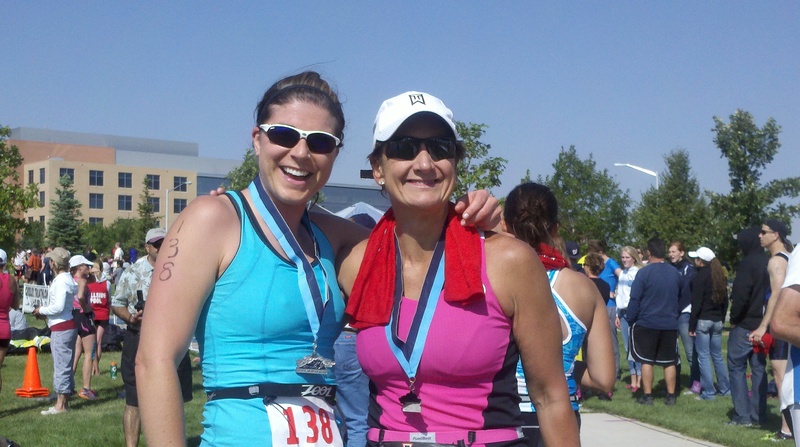 And, YES, I had just run 10 miles without walking a single second at the Cherry Creek Sneak! And, I was now walking during a 5K! UGH!! Frustrating to say the least! Still before I knew it…up ahead was the finish line! My stretch goal time was 1:10:00, my safe goal 1:15. I finished in 1:09:34; Swim (9:26), T1 (1:52), Bike (28:44), T2 (1:22), Run (28:13)…and got a red cowbell for getting 2nd in my age group. Just like when you have one great golf shot during an 18-hole round of golf, those numbers and that little cowbell will keep me motivated and asking with anticipation When’s My Next Event?! 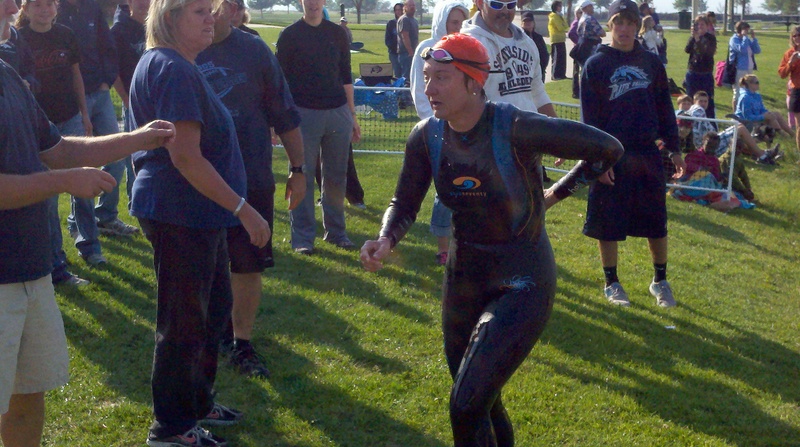 This entry was posted in It's NOT the Destination...It's the Journey and tagged Garmin, Greeley Triathlon, triathlon, wetsuit. Bookmark the permalink.